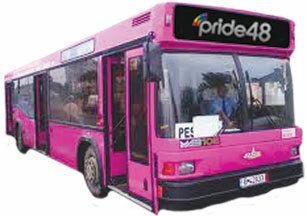 The Pride48 Shuttle will be in operation during the Pride48 Las Vegas 2014 weekend from September 17 to September 22. Time you would like to be picked up (please consider time for disembarking and retrieving luggage). If airport pickup, provide Airline and Flight# so the Pride48 Shuttle can check if your flight is delayed. Pride48 Shuttle volunteer drivers can e-mail Pride48Shuttle@pinkwheelnuts.com to notify of your interest to pick up Pride48 Las Vegas participants. E-mail me at podcast [at] pinkwheelnuts [dot] com. On this episode of DTT Fey catches you up on his house renovations, his trip into the woods and Brenda says a bitter goodbye. All that and sports on Drive Time Tonopah. Call our voice line at 319-535-0266 or 319-535-0BOO. A back-country run up windy mountain roads in the SpyCar. My Dad’s house may have sold. I’m trying to take a vacation. No Tweet July. House repairs are getting nowhere. I drove a Mercedes CLK500 Convertible.